Filmed before the end of the Cold War, RED HEAT is a buddy-cop movie built around not racial, sexual, or 'tudeinal differences between its leads, but political. 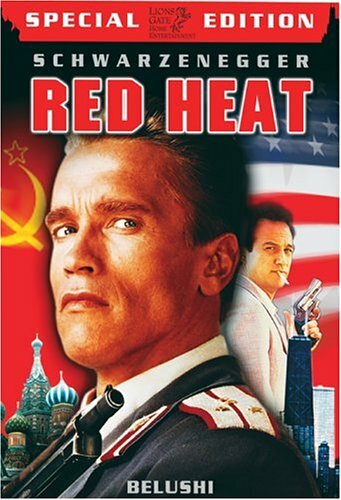 Schwarzenegger plays a Soviet police officer on the trail of fugitive drug dealer. His pursuit leads to Chicago where he is partnered up with smack-talking Jim Belushi. As usual with these kinds of movies, the plot is irrelevant. All that matters are the fights and the chemistry between the two leads. As for the latter, the most amusing fight comes right at the beginning where a scantily clad Schwarzenneger battles other naked Russians in the snow (after busting out the window of a sauna, of course). Frankly nothing keeps up with that level of amusingness, especially once the combat switches to shoot-outs rather than punch-outs. The chemistry between Belushi and Schwarzenneger is fine, but never clips the way Gibson and Glover did in the LETHAL WEAPON series. Still, banter about Communism vs. Capitalism is a welcome change of subject for this kind of genre. The film features plenty of blood and seemingly inappropriate T&A to cover up the general lack of substance. This is a "man's" movie through and through. Almost every female character who appears in the film is a protitue for some odd reason. Oh, and part of the movie was shot in the Red Square disguised as an amateur film. I guess that's cool.